Hey lovelies, my naturalistas in particular, this review was a learning experience for me. I have used extra virgin coconut oil for some years now. It has many great applications but I could not use it for everything I wanted to use it for. Then last month goPURE Naturals sent me a free bottle of their Fractionated Coconut Carrier Oil to use and review. Let me say that this lovely oil filled in the missing gaps for me when it came to using coconut oil. Coconut oil is a solid at room temperature. Which goes against what we think of as oil, since most oils are a liquid at room temperature. As a solid, coconut oil cannot be used as a traditional carrier oil. It is difficult to create an oil blend with a solid. Then comes fractionated coconut oil, which is a liquid at room temperature. As such, it has greater application potential. For me the best aspect of fractionated coconut oil is its ability to be used as a carrier oil and to be used in an oil blend. This fractionated coconut oil is supposed to have the same moisturizing effects as standard coconut oil does. I wanted to test that out. Therefore, I used it on the part of my body I used coconut oil on the most, my hair. I applied the oil to my hair after washing it to help moisturize and seal my hair. It did a good job of moisturizing my hair. My hair seemed to retain moisture after it dried so it is a pretty good sealant as well. I also applied the oil to my scalp. I massaged it in giving myself a very relaxing scalp massage. My scalp remained moisturized and did not feel tight. Sometimes I would use coconut oil on my skin by mixing it in with another body lotion or cream in the palm of my hands. With fractionated coconut oil, I was able to pour the oil into my body lotion, shake the bottle to mix, and I had an already mixed oil/lotion ready to go! It also works well directly on the skin. I was amazed at how it quickly absorbed without leaving a greasy feeling or oily shine. I always wanted to have my own oil blend to use for my scalp. 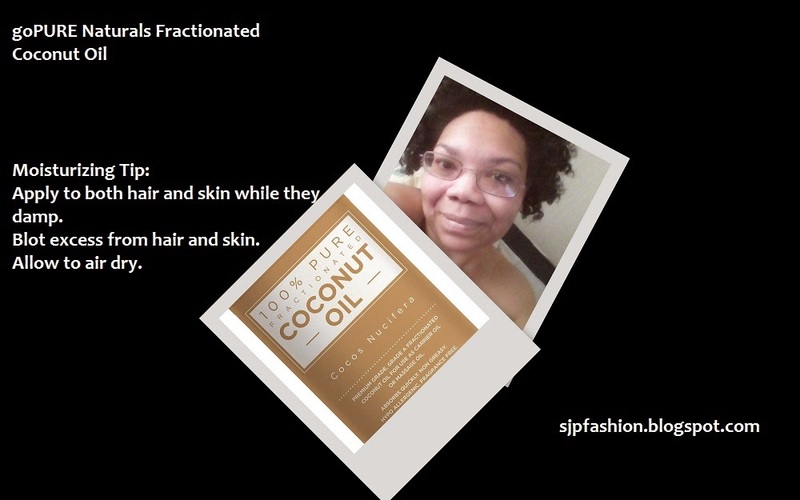 Since I had this ultra-moisturizing fractionated coconut oil, I decided to give it a try. I mixed together argan oil, rosehip oil, goPURE Naturals' Fractionated Coconut Carrier Oil, and two drops of lavender essential oil for fragrance. So far, I like this blend; it absorbs into my scalp quickly and does not leave it feeling greasy. I love fractionated coconut oil now. I give goPURE Naturals Fractionated Coconut Carrier Oil an "A". I cannot wait to create more oil blends and maybe a deep conditioner with this oil in the future. Which type do you use, extra virgin, virgin, or fractionated coconut oil?